Marc Bichler is a lawyer by training and a diplomat by choice. The topic of sustainable development runs as a common thread through his professional career. He joined the Ministry of Foreign Affairs in Luxembourg in 1990 and has consecutively served as Deputy Director for Development Cooperation and Humanitarian Action (1995-2000), as Deputy Permanent Representative of Luxembourg to the United Nations in New York (2000-2005), then as Director for Development Cooperation and Humanitarian Action and Ambassador to Burkina Faso, Mali and Senegal with residence in Luxembourg (2005-2012). 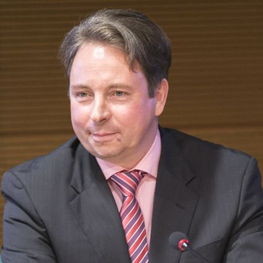 From November 2012 to April 2014, he was the Executive Secretary of the United Nations Capital Development Fund (UNCDF) in New York and is serving since August 2014 as Luxembourg’s Ambassador-at-Large for climate change. In his successive functions, Mr. BICHLER grew extensive expertise and experience in the field of sustainable development in general and of financing for sustainable development, including on innovative financing in the fields of microfinance, financial inclusion and climate finance, in particular.